These canvas panels present an economical and easily portable alternative to stretched canvas, great for students on the go. They are designed for use with all media, and are of archival quality. The 7 oz. 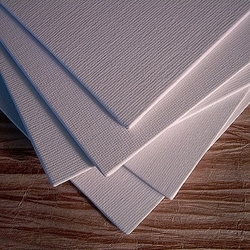 canvas is 100% cotton, triple primed with acrylic gesso and securely glued to a 100% recycled, acid-free board. All canvas sides wrap around and are secured in place on the back side. The convenient label provides an area to identify the artist, title, medium, etc. Sold in Packs of Twelve!